To keep things simple, the 70th Regiment is responsible for running the OCS and WOCS programs for soldiers within the MDARNG (Maryland Army National Guard) and participating States. In addition, they provide training such as NCOES and professional development courses. They are an accredited Army School. The classes are typically provided one weekend a month and not on a full-time basis. The units within the 70th Regiment (Regional Training Institute) include a Regimental Headquarters and two battalions. The first battalion is the OCS Battalion. The OCS Battalion includes an OCS Company and WOCS Unit. The General Studies Battalion oversees the training courses that are provided within the 70th Regiment. My experience with the 70th Regiment (Leader) was very positive. In fact, it was my first real experience outside of an operational unit. I applied for a unit vacancy position (S4 Officer) and was selected. After spending about nine months in that position I transitioned to the S3 Officer position. I will admit that it took me some time to get adjusted to school house life, but I enjoyed my experience in the Regiment. When I served with the unit, there were approximately 100 Soldiers assigned to the unit as instructors and support personnel. On paper, it isn’t a very “big” unit like a traditional Brigade or Regiment, but nevertheless they still have a very important mission. If you have ever served with the 70th Regiment (Regional Training Institute) I would love to hear your story. When did you serve with the unit? What was your duty position? What was your experience like? Just leave a comment to share your thoughts. Also, if you have any questions about the 70th Regiment that I may be able to answer, you can ask them below. I will do my best to provide an answer or lead you to someone who can answer it for you. Thanks. O’er The Rampart We Watch! 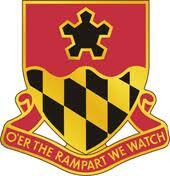 I completed my OCS training with the 70th Regiment in Maryland a few years back. I thought the instructors and training areas were first class. I guess if a soldier is NG or Reserve they’re quite used to the operational tempo of a typical drill weekend, so that if they are selected for NCOES, WOCS or OCS it’s not as much of a shock. Is the training for these courses of instruction compressed so that a week/month of training is accomplished in a single weekend? Or is the duration of the training expanded? I imagine the 70th Regiment’s instructors and support staff have their hands full between running the OCS and WOCS programs while also finding time for their own training. As for officers transitioning from an operational unit to an instructional setting, their efforts would provide unique experiences to pass on to other soldiers who will eventually assume the same responsibilities. I imagine enduring that transition also provides good lessons for the ultimate transition from military service to civilian life. It sounds as if the 70th Regiment could serve as a role model for other institutes, military or civilian. The MDARNG certainly sounds well managed and ready to train future Army Officers. Thanks for your comment, Neil. I will have to agree with you that the Maryland Army National Guard is a great organization and so is the 70th Regiment (LDR). It isn’t perfect (no unit is), but it has lots of great Soldiers and leaders who are dedicated to the mission of training leaders. I enjoyed my time there and consider myself a better Soldier and leader because of the “training” and “institutional” knowledge I gained there. I can understand how it would have taken you some time to acclimate to school house life, but I’m sure you’re glad you were able to. Sounds like it was a great new challenge to take on and I’m glad you feel it was a positive experience.